My biker friends, Trump said during a Q&A at a recent Wisconsin rally. His new friends arent just fans and are now pledging to provide ad hoc security at for their new hero, using violence if necessary. Bikers for Trump, a 20,000-strong grassroots collection of motorcycle-riding supporters, has eschewed violenceat least according to its de facto leader. But it has found that its own supporters are ready to cross that lineif by their own estimation they should deem it required. If that means us having to protect ourselves by taking someone elses life, thats what were going to have to do, one biker said, in a video shared by Bikers for Trump, on beefing up security. 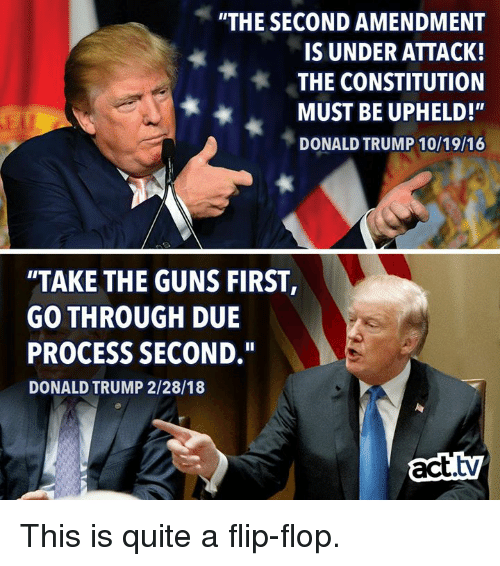 Oh...so you are claiming that Trump did NOT say this? Let me guess - the video was faked? He stated facts. They twisted it to mean something more than it is. Left are the ones assaulting people, shooting people, stealing from people and murdering people that disagree with them. Your hate for anything not radical libertarianism is siding you with the left your actual true enemy. If you are a real libertarian and not a leftist agitator. He stated facts. They twisted it to mean something more than it is. And again he said nothing bad. He stated facts and you are afraid of facts? Maybe you like leftist are delusional? Left are the ones assaulting people, shooting people, stealing from people and murdering people that disagree with them. I agree on the above...The agenda-driven MSM ALWAYS twists Trump's words. We need THAT mystery answered. Instead of escalating the rhetoric, The President needs to be Presidential and use his oath and authority to order LE and military to enforce the border and indict and arrest those PAID anarchists who have been given carte blanche to target and assault conservatives, and other anarchists, globalist and Marxists who are censoring and banning conservative and pro-constitutional speech. Again, why isn't Law Enforcement and Justice Dept allowed to do it job?